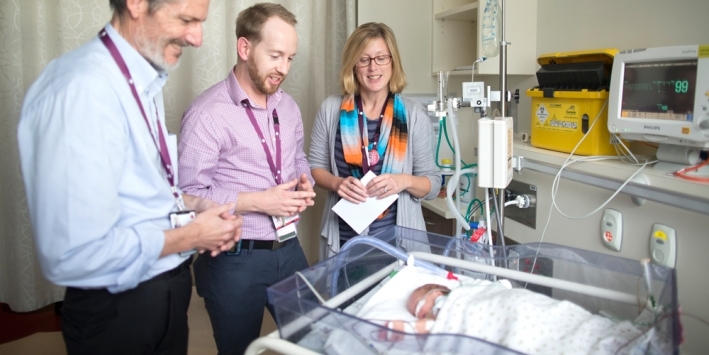 The HIPSTER trial is an international, multi-centre, clinical trial conducted in units in Australia and Norway, led by the Women’s Newborn Research Group. The trial compared two types of breathing support for premature infants. Nasal high-flow therapy is a newer type of support that has been shown in a previous trial at the Women’s to have similar effectiveness to nasal continuous positive airway pressure (CPAP), when used later in infants coming off a mechanical ventilator. It is more comfortable, favoured by parents and nurses, and less likely to damage the skin around the nose. The purpose of the trial was to determine whether high flow is as effective as CPAP when used as the first mode of breathing support after birth. After recruitment of 564 infants, the trial showed that treatment failure was more common in infants treated with high-flow. However, infants for whom high-flow failed could receive ‘rescue’ CPAP, and the rates of intubation (insertion of a breathing tube for ventilator support) did not differ between the two groups. The trial concluded that CPAP was more effective in avoiding treatment failure, but that high-flow can be used without any increase in intubation, provided that ‘rescue’ CPAP is available.